Eight weeks and the protest goes on. Hours after the IRA disposed of some of its weapons in a move to bolster the peace process, there is no peace on the walk to Holy Cross School - and no sign of it coming. In the wake of the September 11 attacks in America, the world's media forgot about Holy Cross. We've become characters. We walk on, they do their shouting, and then we walk back again. But the disturbing scenes of loyalist protesters abusing Catholic children and their parents as they walk the route to their school, ostensibly lying in the "wrong" area beyond an invisible demarcation between the two communities, continue. And so for the 38th time, the parents and governors of the school gathered for yet another walk through a security cordon of armoured vehicles, soldiers and riot-gear clad policemen while loyalist protesters watched on. Whatever the protesters thought of the IRA's move they certainly were not prepared to share it with the media - other than to hold up placards celebrating "IRA surrender". Father Aidan Troy, chair of the school governors, arrived at this posting in the summer after seven years abroad, including a stint at the Vatican. In the past eight weeks, he looks to have aged years and has little to show for it. Everyday he leads more than 100 children and their parents through the security cordon. Others go in a back route involving crossing a playing field. As he reaches that gate Father Troy puts on a brave face and welcomes the little girls as brightly as he can. But behind the scenes attempts to bring the protests to an end by bringing the governors together with representatives of the predominantly Protestant Glenbryn estate have so far failed. Eleven children of a 200-plus school have been transferred to other schools by their parents. Holy Cross has quite simply become a seemingly unsolvable sectarian crisis. And there are some people who are no longer joking when they suggest that the children at the centre of this will have had children themselves before it is resolved. "We have slipped into what has become a dangerous routine," says Father Troy. "We've become characters in some kind of play. We walk on, they do their shouting, and then we walk back again. "There are days when the violent intent is explicit, there are days when it is different. "It is as if the protesters are saying to us 'this is the way that we are and this is what we do'. And while all of this is going on the children are just deteriorating." 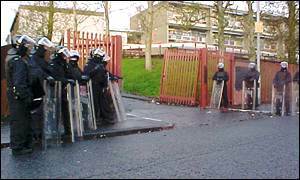 On the Tuesday night hours after the IRA's move on arms, the tension was no lower at the unofficial dividing line between the Protestant and Catholic communities on Ardoyne Road. As the evening wore on, teenagers gathered on both sides with armoured cars in between. Fireworks were thrown - a marked decline in hostilities from some nights this year. But elsewhere in north Belfast loyalist paramilitaries were suspected to be behind another pipe bomb attack on a Catholic family. Elaine Burns stands in the huddle of mothers waiting for the walk with her eight-year-old as the security forces ensure that the route is prepared. It's cold as the low hazy autumn sun rises over Ardoyne. The little girls in their grey skirts are getting cold, feet being stamped. Over the last eight weeks her child has witnessed verbal abuse, a blastbomb attack on the police lines, urine thrown at parents, sectarian name-calling and fireworks. Despite the IRA beginning decommissioning, she was not optimistic for a positive response. "Nationalists and republicans want decommissioning but I'm not sure about the loyalist people in Glenbryn who are out doing this every day. "We desperately need to work this out. I have lived through 30 years of violence and I never thought that I would be bringing my children to be educated in hatred, to need to cling to me all the way to school. "They used to see the tricolours and the union flags flying in the different areas and just thought they were there for decoration. Now they are asking me which is a good flag and which is a bad flag. "I just hope that somewhere over there they can find some leadership that recognises the importance of what the IRA has done and what it should mean for all of us, all of us in Northern Ireland. "Because we're just so tired and drained and we can't explain to the children why this is still going on." The stress is not confined to the daily walk to school. At the health centre in the heart of the nationalist Ardoyne, the workload of local GP Michael Tan has doubled in two months. In short, he says, he has gone from being a family doctor to the head of an acute medical service trying to deal with a massive crisis. "Everything that we predicted would happen has happened," said Dr Tan. "Some of the kids have suffered an immediate traumatic response but for much more of them it has been delayed." Dr Tan said that his surgery had seen a massive rise in bed-wetting, nightmares, flashbacks, loss of appetite and a leap in behavioural problems such as children becoming argumentative towards their parents. "Some of the children were given limited courses of medication to help them sleep but then stopped because we don't want them becoming dependent. We tell the parents that they must go to counselling. "There is a counselling service here in Ardoyne but it is fully booked. So they come back to us for more medication. Or some of them go back on to it even though we have told them not to. "I have never seen anything like this before in the 11 years I have worked here. Nothing like this before."